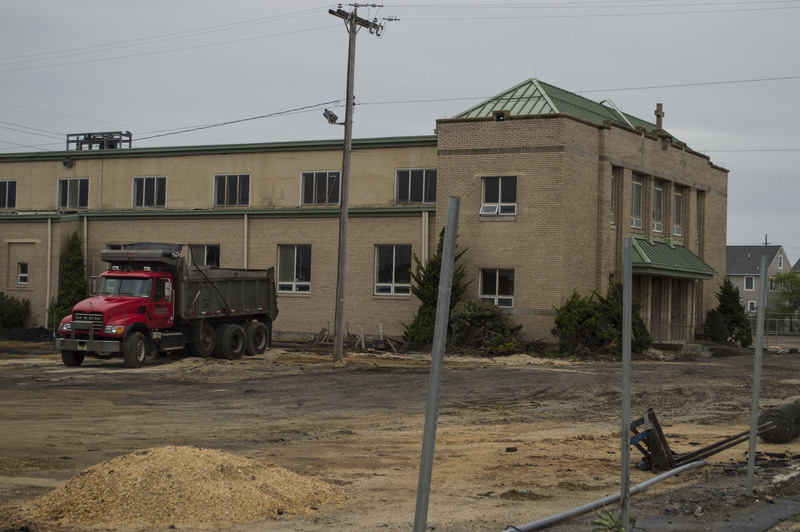 Crews have begun the process of razing the former Our Lady Of Peace Catholic church in the Normandy Beach section of Brick Township. The church, once a year-round parish that was gradually drawn-down to seasonal use by its owner, St. Pio of Pietrelcina in Lavallette, was heavily damaged during Superstorm Sandy and never reopened. All of the parish’s services are now held at the Lavallette church. Our Lady of Peace was located on Route 35 north. Since the storm, the church’s expansive parking lot has served as a staging area for construction efforts up and down the barrier island. Brick officials told Shorebeat the church’s lot was partially added to the tax rolls since the parking areas were being operated as a for-profit concern. The church paid $1,590.75 in property taxes last year for its parking area, a far cry from what will be generated by the 21 homes that have been approved for the site. 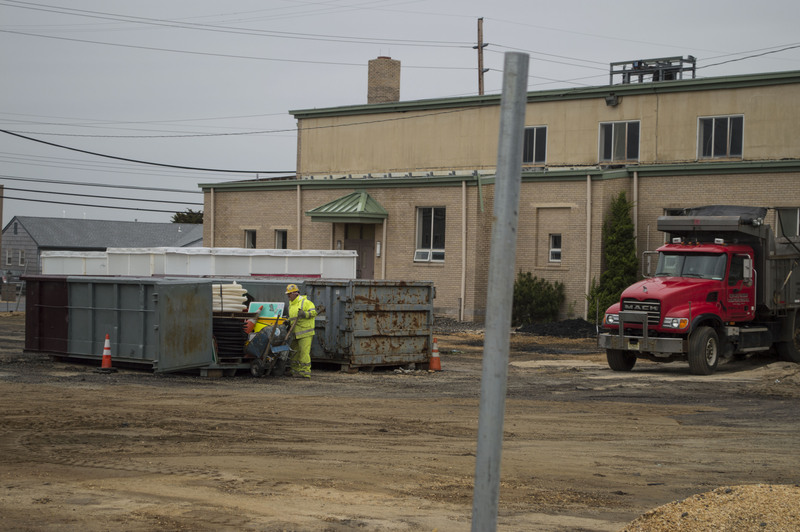 The demolition project is being performed by George Harms Construction, which used the site as a staging area for the Route 35 rebuilding project. The demolition of the church building had been planned for some time to coincide with the completion of the highway. By Tuesday, the bulk of the roof of the church building had been removed and the interior had been largely gutted, with work to remove many of the walls underway. The new housing development was approved by the township’s planning board last year. Richard DiFolco, an engineer hired by the parish, told the board that that site will be graded with imported fill, and 21 single-family homes will be constructed, each of which will include driveways, garages and landscaping. The plan does not require any variances and the lots will conform to current township zoning ordinances, officials said. The 21 homes proposed will comply with the township’s “cookie cutter” ordinance, each being constructed with a different exterior facade, said DiFolco. The homes, which will each include four bedrooms, will be individually owned – no homeowners’ association is planned. Each home will include between four and seven spaces for cars to park off the street, and each driveway will include room for a vehicle to make a “K” turn to avoid having to back out onto the street.